How do you re-invent a classic? Simply design a cube and twist! 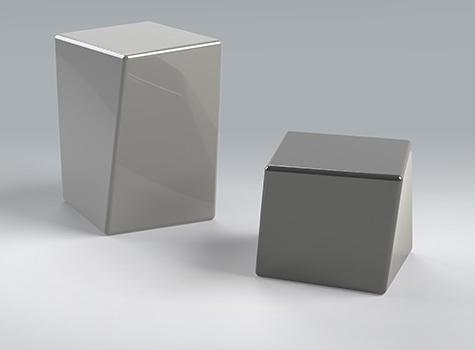 This incredibly practical yet stylish design has evolved from our popular cube seat range. The Twist can be manufactured in all RAL colours and is lightweight in design making it easy to manoeuvre. The Twist comes as a single seat and high table, which is ideal for the user to take a seat and work on their laptop or tablet. 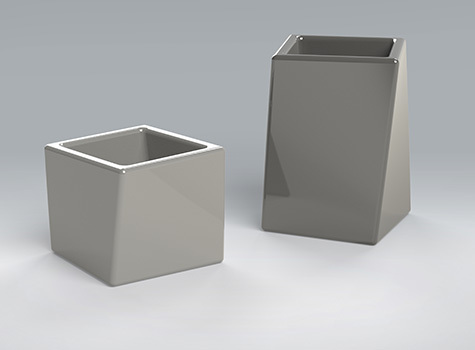 Also in matching planters these stylish additions to the collection are perfect for exhibitions, shows and conferences. Manufactured to allow greater flexibility in space planning. Available as seating, table and planter options. Create a welcoming space to both impress and relax visitors in commercial and residential settings. Have your Sui Generis products manufactured in your corporate colours or any other colour of your choice. Call or contact us now for a quote: all prices exclude VAT, delivery and installation. Trade discounts available. 1. Weighted: Supplied weighted to prevent people from moving installation to another area. Weighted modules are ideal if you would like the flexibility to move seating at a later date and the security that they will be safe. 2. Un-weighted: This supply option offers the utmost in flexibility and is ideal for domestic use or in areas where you want to move seats quickly and easily, such as events/exhibition spaces. 3. Fitted with anchor bolts: Seats are complete with anchor bolts for permanent fixing - ideal for public open spaces or where security may be an issue. 5. With drainage - 8 x 12mm drainage holes. 3. Fitted with anchor bolts: Complete with anchor bolts for permanent fixing - ideal for public open spaces or where security may be an issue. 5. With drainage: Modules suppled with drainage holes in bottom. Where are our Twist seating, tables and planters used? Twist seating and furniture is ideal for commercial and residential projects. 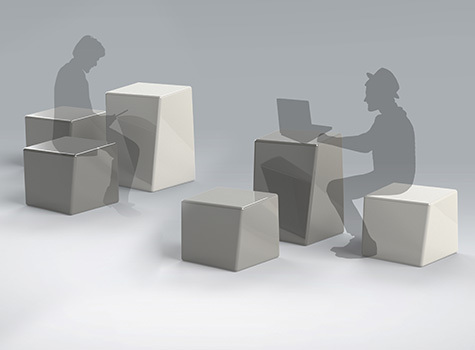 Versatile, comfortable & durable, our seating range will enhance your environment and most importantly, stand up to the rigours of heavy everyday use. Our products are ideal for office furniture, lounge furniture, reception furniture and waiting areas, restaurant lounge furniture, foyer furniture, garden furniture, outdoor furniture, street furniture, conference furniture and public communal areas including lobbies, pool areas, spas, courtyards, playgrounds and play areas. Who do we manufacture Twist seating and planters for? 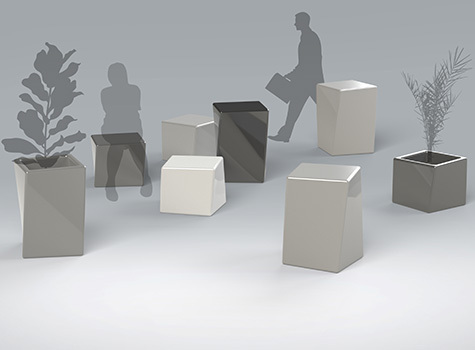 Sui Generis produce a range of modern modular seating, landscape features and planters for commercial, urban or decorative gardens and public spaces. We manufacture and install our stylish seating in Great Britain and deliver throughout GB, Europe and USA for Landscaping Architects, Local Authorities, Councils, Landscape Contractors, Professional Landscapers, Landscape Industries, Garden Designers, Urban Designers, Interior Designers, Town Planners, Schools, Colleges, Housing Associations, Consumer market, Statutory Bodies eg: English Heritage, National Trust, Leisure Organizations, Sports Grounds, Leisure Centres, Parks and Golf clubs. Call our specialist team to discuss your requirements! Why choose composite moulded products? Whilst its vibrant appearance is one of the first things that draws people's attention to our composite moulded products it's often it's hidden qualities that really sell it - extremely easy to clean, corrosion resistant and vandal resilient. Yes a very extensive choice, we can manufacture the items to the BS/RAL colour of your choice. Are your Garden and Landscape products suitable for outside use, all year round? Absolutely, our products are weatherproof being able to withstand the extremities of British weather be it the hottest of summers or the coldest of winters. Are your Garden and Landscape products easy to clean? Yes, their smooth finish allows for the easy removal of everyday dirt and grime by simply wiping over with a soft cloth or sponge that has been immersed in warm water, for more stubborn stains a mild detergent can be added to the water. Following cleaning, seating products can be dried and ready for use almost immediately by wiping over with a dry soft cloth. Do your Garden and Landscape products require any specialist treatment? No, unlike many other outdoor products, our composite moulded products require no specialist treatment to protect against rust or decay. However, we would recommend the occasional application of a UV wax solution to help protect against UV exposure. Will the colour of your products will be affected by UV exposure? Whilst the gel coats used in the production of our furniture contains pigments with high light fastness ratings, the furniture's colour may suffer from a slight dulling over time due to UV exposure. To help protect against this a specialist wax solution is applied to the furniture prior to it leaving our factory. However, we would recommend further applications of this wax during the course of the furniture's life. What about the risk of vandalism? Types of vandalism are wide and varied however; our composite moulded furniture is capable of seeing off some of the most common forms. Tough enough to withstand harsh impact, for example that of a hammer. Whilst marker pen and graffiti can normally be removed with the use of specialist wipes, which are available from Sui Generis. Attempts to inflict damage from a cigarette lighter will often see the perpetrator inflict more damage on themselves than the furniture. Ultimately though, as with most items, if somebody is intent on causing damage they will probably succeed. However, in the event that someone does manage to inflict surface damage, the affected areas will not rust and localised damage can often be repaired as opposed to complete replacement. What quality accreditations do you have? ISO 9001 and ISO 14001, having first achieved ISO 9001 accreditation in 2002 our Quality Management System and associated procedures are now firmly ingrained into our everyday practices resulting in stringent quality becoming second nature to us and ensuring that you will be left with a product of the highest quality. please view our customer testimonials. Essentially our Landscape and Garden Furniture products are maintenance free, however, following the below guidelines will ensure maximum life expectancy. As with many outdoor products, contamination from substances such as bird droppings and tree sap are potentially harmful and should be removed as soon as possible. The smooth finish of our furniture allows for the easy removal of such substances as well as everyday dirt and grime in three steps. Step One: Initially spray down the furniture with a water hose to loosen any contamination. Step Two: Wipe the furniture over with a soft sponge or cloth that has been immersed in warm water. For more stubborn stains add a mild detergent (no stronger than dishwashing detergent) avoiding high acidity or alkalinity. Step Three: Rinse well with clean water ensuring that no detergent is left behind. UV exposure may result in the furniture's colour suffering from a slight dulling over time. Prior to delivery the furniture has already been treated with a specialist wax solution to protect against this, however, further applications of this wax solution are necessary on a quarterly basis to help ensure continued protection. This wax solution should be purchased direct from Sui Generis and applied as per the supplied instructions. • Strong alkaline cleaners or solvents such as acetone and lacquer thinners. • do not overcoat the furniture with any other product. GeoMet is a stunning collection of geometrically-shaped modular furniture pieces ideal for urban environments, recreational spaces and large-scale commercial interiors. The range has been designed for mix and match use or standalone single units. Each piece in the GeoMet collection is handmade in the UK by highly skilled crafts people. The entire range is composite moulded which is the perfect outdoor furniture material as it's weatherproof, long lasting and requires minimum maintenance. Sui Generis is the leading composite moulding company that creates standard and bespoke seating designs. Weather proof - can withstand anything the UK weather can throw at it! Great Britain and delivered throughout GB, Europe & USA.